This stamp set is a keeper! Pinwheel is the May stamp of the month for Close to My Heart. Who doesn't love pinwheels? I'm also a sentiment junkie and it has some great all-purpose joyful sentiments. It's also compatible with our Artiste Cricut Cartridge. 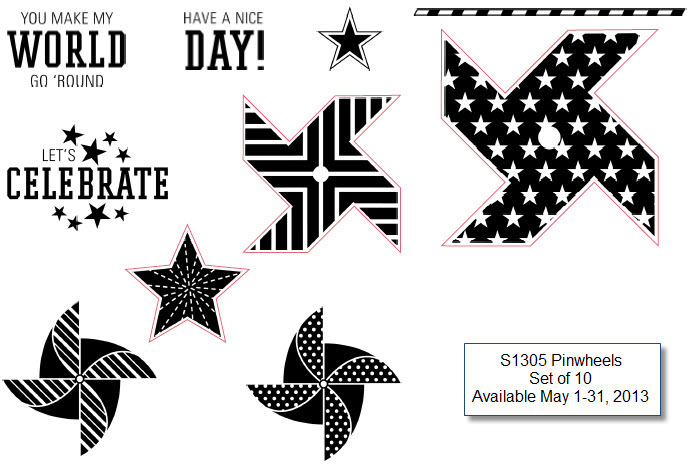 The two big pinwheels and the larger star can but cut from our Cricut and then stamped. That means, you don't need scissors to get wonderful shapes. I love it! If you've just come from Annette Green’s blog, welcome! If you're new to a hop, it goes in a big circle by following the link at the bottom of the post. If all goes well, you'll end up right back here when you've visited everybody. I created my card for a friend using last year's Footloose papers. I was inspired by something I had saved on Pinterest. Here's Kathy's card. This stamp set is available for just $5 with a $50 purchase... Guess what? We have another promotion going on and it counts towards the $50 that's needed to qualify. How cool is that? Click here (it will open in a new window so you don't get lost in the hop) to see more about that promo and to see how you can get the most savings! Moving on to stamping a bit, I’m going to tell you about our card kits. They’re wonderful for anyone who wants to make handmade but doesn’t want to spend the time and energy DESIGNING handmade. We have Workshop on the Go kits that are specifically for card making They’re great. They advertise “Supplies to make 15 cards.” Yeah right. The kit does include cards and envelopes for 15 cards. That’s true. However, you get enough supplies for 5-10 more cards! Where else can you get 20-25 cards for $30? You can grab some cardstock and your own envelopes or buy our bulk pack of pre-scored cards and envelopes. They’re a wonderful time-saver. I used to cut my own card bases, these babies are wonderful! Each kit contains an exclusive C-sized stamp set, 2 sheets of pattern paper, 4 sheets of cardstock, 15 cards & envelopes, 15 yards of ribbon, an embellishment and a full color cutting, stamping and assembly guide to make the first 15 cards. Granted, you’ll need a few more supplies like inks, blocks, 3D foam tape, and tools to make them. Total time commitment? About 3 hours if you’re working by yourself. *** (If you bring this kit to a crop, I will make no warranty or guarantee on how long it will take for you to cut and assemble these cards.) And yes, I may be talking about YOU… or I may be talking about myself… I am guilty as charged! Here’s the Chantilly Workshop on the Go. By flipping over some of the patterned papers, you’ll have even more variation in your cards! Local friends: Keep an eye on my workshop schedule. We’ll be working with these kits soon! Can’t wait get yours today! Labels: 2013SS Idea Book, Card, Did You Know? Last week I showed you a fabric bow I had created using the Cricut. I made it using the Chantilly Textiles. This shape bow is from the Cricut Artiste Collection. It’s found on page with the letter “G” of the handbook. Just think G for Gifts because gifts come with bows. That’s the way Jeanette Lynton and her team organized this Cricut cartridge. You’ll find lots of other mnemonics in this cartridge too (F for flowers, M for movies & mustaches). Let me know if you just had an “Ah ha” moment. Since we’re crafting and won’t ever be laundering our project, there’s no need to prewash or pre-shrink our fabric. Iron it flat, then apply heat and bond to the area that you’re planning to cut. PLAN. Don’t waste fabric or Heat and Bond. Start with a medium heat setting on your iron. I had to go to medium-high on my iron to get the Heat and Bond to actually bond. When you’re ready to cut it on your Cricut, put it on your mat. My Cricut settings were Speed: Medium. Pressure: Max. Blade: 6. Cut your fabric. I had no reason to use multi-cut. It cut beautifully. Remove the the fabric and heat and bond paper from your mat IMMEDIATELY after cutting. Change back to your old blade. I forgot…. but I had been meaning to replace my old blade anyway. The backer paper may remain in your mat. This isn’t the same backer paper that you have when cutting vinyl. This stuff will stick like crazy and tear into little pieces…. I left it on for just 2+ hours and if it had been cardstock, there would have been zero problem getting off. This is not like cardstock. It’s more like getting a Kleenex off your mat. There’s 8 minutes between these two pictures according to my date/time of my camera. 8 minutes of scraping a mat to get it somewhat useable. Ugh. Just learn vicariously from me: take the paper off immediately. Stay tuned, I also created some fabric roses! I’ll be creating a post about them soon. 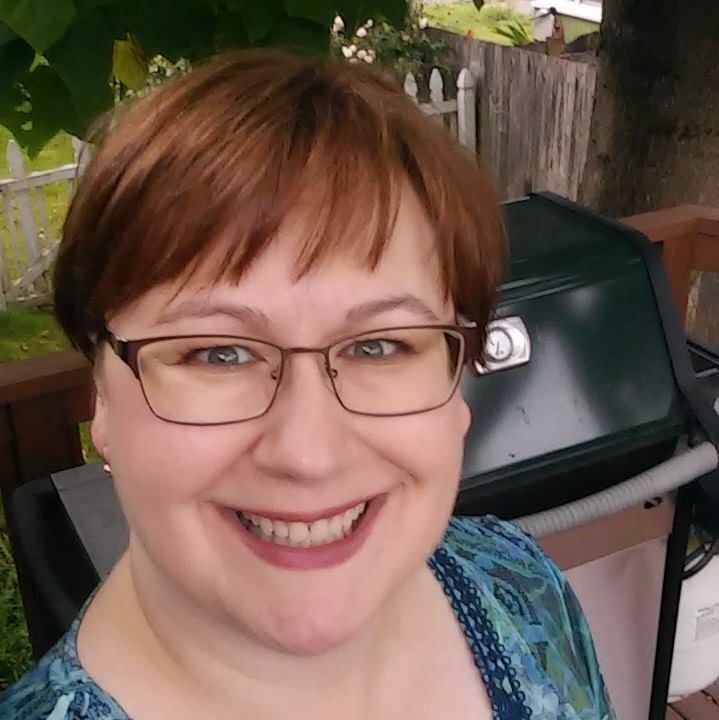 I’m starting a new series of posts titled “DYK” or “Did you know?” While I’ve been posting artwork and specials about Close to My Heart products, I’d love to tell you more about the whole idea of Close to My Heart. Today’s post is about scrapbooking. Did you know that our scrapbooking products are fabulous and don’t require stamping? Yes, we’re a company that evolved from the stamping world, but you don’t have to apply ink to our paper to have fabulous scrapbook layouts! This layout is featured on pg 46 of the current Idea Book. It’s created with just the paper pack and the My Stickease. No stamping! Our paper packs consist of 6 beautiful sheets of double sided pattern paper, two of each sheets. Along with that, you get 6 coordinating cardstock. And we’re not talking white or cream. We’re talking about the vibrant colors that make our pattern papers beautiful. For Later Sk8r, you’ll receive the following cardstock sheets: 2 Outdoor Denim, 2 Slate, 1 Pear, 1 Whisper . You may need to pick up a package of Colonial White or White Daisy cardstock, but you’ll be using our white paper in nearly every layout anyway. However, to make great layouts, you won’t need to purchase a whole 24-sheet package of Outdoor Denim to make a great layout. It’s included in the paper pack! Secondly, we always have two sets of embellishments that are designed to go with a specific paper pack. We’ll have either My Stickease ® assortments which are high quality cardstock “stickers” or complements made of canvas, chipboard, or foil. They’re listed right with the paper packs and their item number is nearly the same as the paper pack but ends with a “C.” These embellishments are almost always flat. They make great embellishments without adding much bulk. On the back of the My Stickease sheets there’s layout suggestions too! Additionally we have an embellishment assortment. They’re a little more dimensional and take your project up a notch. For Later Sk8r they’re 7 adhesive-backed rubber shapes. In other collections they can be acrylic flowers, ribbon rosettes, crocheted items, fabric covered buttons, quilted fabric flowers, and more! See pages 117 and 118 of the current Idea Book to see them all! Need a title? No worries! Our My Stickease products always contain an element that would make a great title or two. Need a custom title? We have a wide variety of self adhesive letter stickers to choose from. We have small, large, cork, canvas, chipboard, kraft and glitter! See there? There’s no need to pull out the stamps! See you soon with the next installment of DYK. To see all of these posts together, you can click on the “Did you know?” label in the right sidebar of this blog. Labels: 2013SS Idea Book, Did You Know? Earlier I created my first post on some little purses I created. Here’s some more! This is Ruby cardstock with the For Always zip strip and the black tulle. It’s easy to work with and makes such a great accent! This last purse has a Chantilly Textile (FABRIC!) bow cut on the Cricut. It was super easy though it does take a little preparation. Don’t just throw your fabric on a mat please! I’ll post a tutorial soon. The bow is from the Artiste Cartridge. All purses were created with the CTMH Artiste Cartridge. Are You Going to Wait Another Year? In my experience, it only happens once a year… so it’s time to sign up and celebrate! This year’s promotion for new consultants is 4 free stamp of the month sets when you sign up as a new consultant. This year our kit is only $49 for the basic kit and is valued at $155. Here’s a look of what you get. There’s no minimum sales required to keep the kit. There’s no strings attached. You can build a business, save money as a hobbyist or buy the kit and never look back. I love to help people and teach them. But I'll never push or pester you to go beyond your personal goals and dreams. That’s just not my style. New items have been popping up here all week! Grab them before they’re gone and check back often! I’ve been making some cute little purses lately for some party favors. They’re so simple to make with the Artiste Cricut Bundle. They don’t even need glue to hold them together! I’m also using our little hook & loop dots to keep them closed. That way I won’t have to fuss with tying a ribbon when it’s time to fill them up right before the party. They will be ready to go. This last one was inspired by the purse I saw on Jeanette Lynton's blog last month. I just had to incorporate those Just Blooms Butterflies!